Many artists go to great lengths to prevent their material from being leaked before they are officially released, but it wouldn’t have been too hard to get this week’s band’s material as the leader singer and primary songwriter has been very careless over the years about leaving their material in public places. He once left an advanced copy of the 1997 album Around the Fur in a Sony Walkman in a Times Square branch of McDonalds and then left a copy of the follow-up, White Pony, on an American Airlines flight. His bandmates know that he’s quite absent-minded and easily distracted – anyone would think he was a teenager – and that why that called him Waylaid! 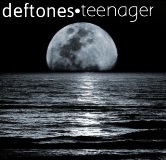 Anyway, the track in question is from the aforementioned 2000 album White Pony and is called Teenager. The band are the Deftones and are a metal band from California who formed in 1988 and originally comprised lead singer/rhythm guitarist Chino Moreno, Dominic Garcia on bass, Stephen Carpenter on lead guitar and drummer Abe Cunningham. The line-up changed a number of times over the first few years, but Moreno and Carpenter have been the mainstays throughout. Cunningham have been there since the beginning but took a three-year break between 1990 and 1993. Chi Chang was the bass player between 1990 and 2009 but the current incumbent is Sergio Vega and they added Frank Delgado as the keyboard player in 1998 and he’s still there too. White Pony, which is a slang term for cocaine, but there are apparently other meanings available, was a little bit of a change of direction from their previous album as the songs were melodic and Teenager is a prime example of that. Listen to it on the original album and it sounds scratchy is if playing if from an old piece of vinyl that had been skated on a number of times and has a trip-hop beat that gives it a great atmosphere, but the version on the 2005 B-Sides & Rarities album doesn’t include the scratching line but still retains the atmospheric texture. It’s a beautiful ballad of lost love. In 1997, they signed to Madonna’s Maverick label, a subsidiary of Warner Brothers, and charted five albums with the most successful one being their self-titled in 2003. They are still recording and their most recent album, Gore, in 2016, included a new ‘alternative metal sound’ but provided them with a number five hit album, their highest to date in the UK. They’ve never really crossed over to the main stream in the UK. They continue to have a cult following because of the eight albums they’ve charted so far with a cumulative total of 14 weeks on the album listing.